Hi, what manufacturer of CA do you use? I don't rate it any more and was coming to the conclusion that it had become 'watered down' here in the UK to either make production cheaper or for it to be safer. It no longer seems to have a strong bond or take quickly. I have always used Loctite, prism 406 if I can get it. We used to use this where I used to work and it actually held drive belts together on a beer bottling inspector for over a week till parts came. Now it won't even hold plastic. I use a variety of CA types and manufacturers. The brand I used for that operation was Hot Stuff's Super "T" CA. I believe that came from Lee Valley. I am no expert on CA glues but one thing I know is that they do have a shelf life, generally considered about one year. I imagine they last longer in dry climates. We used to use Loctite and had their representative come to site who described how best to use and keep it. Since then I have always kept it in a fridge apart from one for rubber that is kept in the freezer. I then put the small amount to be used on a tile and return the bottle to the fridge. I have kept it this way without it going off for many years. However, I have tried new bottles and doesn't seem any better. Just seems you have to hold things together for ages before it sets and then it is still easy to pull apart. I know the way I use or store it has not changed. There is also a purple bottle called Safe ZAP which is supposed to be "fumeless" and is medium viscosity. I have not tried this one. The viscosity obviously affects the drying time but it also influences the gap filling ability. Thanks Don. Best of luck with all that coppering and rigging on the Stefano. I will be on shore leave for a month starting Monday so I want to show the extent of my progress before I leave. I managed to make all the spars. You will notice that the boom is slightly different boxwood. The lighter stuff is Castello, just like I used for the bowsprit. I had originally planned to make all the spars out of boxwood but never checked to see if my stock was long enough. Alas I decided to draw the line at the boom which shall remain unpainted (poly) which I rationalize will provide balance to the bowsprit. 😀 I'll paint the yards and the designated portion of the mast/topmast black and maybe the gaff but if that doesn't look right I'll remake the gaff out of boxwood and leave that unpainted. If anyone could enlighten me as to how to make the mast cheeks it would be appreciated. I can understand the two dimensional drawing but without hollowing out the portions that sit against the mast I don't see how they will fit properly? It's probably right in front of me. Looks good Ian, where are you getting boxwood from? Typically the area on the mast where the cheeks are attached to the mast is squared off or at least flattened off on two sides for the cheeks. 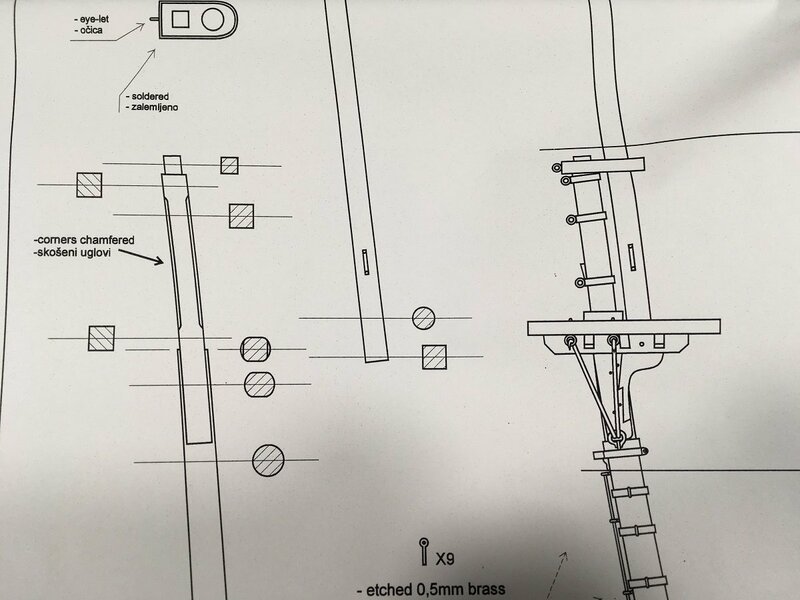 Check out the plans for the Stefano foremast. As you can see two sides are flattened off for the cheeks to sit on. It looks like in the picture the top end of your mast is squared off, do the cheeks not sit there? Don, as usual thanks for being so helpful. I was a little stuck because the Cheerful plan doesn't show the mast sides being inset nor the cheeks being mated to the mast. However upon closer inspection of Chuck's pictures I see they are indeed inset. I have been totally negligent in providing any sort of build log - I am sorry about that. However I'm calling this project done. I will have to figure our a stand down the road. Thanks for following. If there are other pictures you would like me to show I am happy to do that. Boy she does look pretty. You did an absolutely masterful job on the Cheerful project. I do hope you enjoyed building it!!! One of the best Cheerfuls I have seen and I have seen a whole lot of them. Great job! You should be very proud! Thank you B.E., Chuck and Rusty! It has been an enjoyable and an educational build that benefitted tremendously from your own Cheerful efforts. Chuck it is a beautiful design and your mini kits were indispensable. Thanks to all of you for the likes and following this build. Lastly, I have completed the stand. I routed an inlay into a piece of maple and applied several coats of wipe on poly. Because I didn't have the foresight to install bolt holes into the keel I used some threaded brass rod with acorn nut heads (on starboard side) to secure the assembly. Probably not as strong as the traditional method but the ship will be housed in an acrylic display case and shielded from unfortunate nudges. Amazing build Ian!!! You are da Master. Going to be hard to ever go back good old walnut after being spoiled on all that boxwood. Take Care my friend. What's up next? Thanks everyone for the likes! Gregory: thanks and good luck! Don: where have you been? I know I’m speaking for many mates when I say I really miss your updates and beautiful work! What’s next? David Antscherl’s Hayling Hoy. Outstanding Cheerful and I am eagerly looking forward to a Hayling Hoy.